Laser 1 Technologies has the power and accuracy to handle most precision laser cutting projects. We do general flat sheet cutting on a variety of metals; we also specialize in cylindrical and rectangular tube cutting. 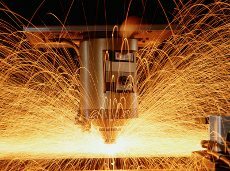 Some of the materials that we laser cut include mild steel, aluminum, and stainless steel. We can custom cut small parts or very large parts. We specialize in working with thick metals and excel at jobs that other facilities would find very difficult. Our manufacturing facility has the technology and resources to handle the most intricate material cutting challenge and support any volume. We have the experience and engineering ability to provide you with design and application support. We pay attention to the details, from the initial documentation review to first article inspection; our systems ensure a quality job done right the first time to meet your specifications. Our responsiveness and commitment to on-time delivery help ensure that we support your company production schedules and delivery needs. Our prototyping services can deliver parts in 24 to 48 hours. Our normal production lead times are one week or less. 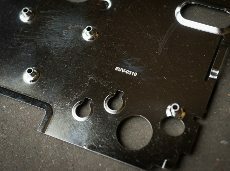 We can provide you with shim material to .002”. We can cut the intricate patterns needed to support your rebuilding and refurbishing of large equipment and machinery. 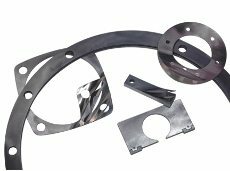 We can fabricate shims for rebuilding truck axles, truck assemblies, heavy equipment and farm equipment. Find out more about Laser 1 Technologies shim capability. Laser 1 Technologies can handle a variety of materials, shapes and sizes for tube cutting, including cylindrical tubes and rectangular tubes up to 3/8” wall thickness. We are happy to announce the long anticipated arrival of Multi-Axis Automated Fiber Laser Tube Cutting System to Laser 1 Technologies facility. Why Adige Lasertube LT 5? 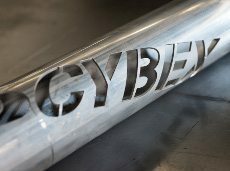 The Lasertube LT 5’s flexibility and high performance cutting capabilities make an ideal machine to serve a number of industries; agricultural and industrial products, furniture, exercise equipment, hospital and medical devices, construction equipment, fixtures and racking, and any products using tubes as their components. Dramatic reductions in fabrication time and costs. Lasertube LT 5 processes round, square, rectangular, and special shaped tubes plus optionally angle iron, channel and flat bar. To learn more about our custom laser cutting abilities, call us at 651-451-3444. 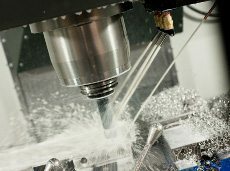 Our precision machining (including CNC machining and turning centers) is a high quality service and can be used for a variety of products. We can do your complex parts that require multiple step machining or do general machining. The part profile can be from 3” to 8 “and we can support your volume quantities in batches of 50 to 500. We can do quick turn for prototype support; our engineering department can assist you in determining the most cost effective methods to meet your application requirements. All production parts are certified by our full inspection process. Can work with most any type of metal or plastic. Prototyping: About 1 week. Normal lead times: 3 weeks. Fast, Easy, No Hassle Service. Our Machining Facility is conveniently located near both St. Paul and Minneapolis Minnesota. In addition to Minnesota, we serve many clients located in Wisconsin, North Dakota, South Dakota, Iowa, Nebraska, Kansas, Illinois and Indiana. Starting with your requirements, we can create a quick turn mock up to support your product design and development efforts. We can follow that up with fully functioning prototypes for your first article approval and manufacturing validation stages. 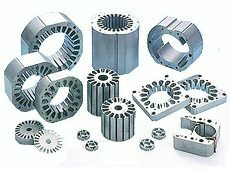 After verification of the products conformance, we can gear up to support your needs with economical production runs. Laser 1 Technologies is your manufacturing support from product concept through volume production. Laser 1 Technologies can fully support your product finishing needs by providing painting; plating, powder coating or other finishes to give full turn-key support for your product. 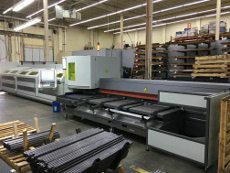 Laser 1 specializes in laser cutting thick metals and working with large parts. Laser 1 Technologies can handle parts of most sizes and weights. We also can work with a variety of materials to give maximum flexibility in supporting your product build. By giving you rapid and cost effective support, we can help assure that you maximize your profits by meeting your schedule and cost targets for your product introduction or re-design. Laser 1 will provide the engineering support needed to ensure design manufacturability and determine the most appropriate materials and technologies to maximize cost effectiveness. 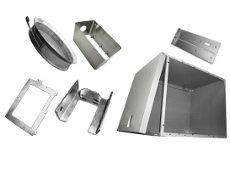 Contact us or call us at 651-451-3444 to find out how our custom sheet metal fabrication can support your needs. Our Sheet metal Fabrication Facility is conveniently located near both St. Paul and Minneapolis Minnesota. In addition to Minnesota, we serve many clients located in Wisconsin, North Dakota, South Dakota, Iowa, Nebraska, Kansas, Illinois and Indiana. Laser 1 has the capabilities to handle a large variety of applications; precision cutting thin laminate material allows us to meet your motor lamination needs. We laser cut laminates for all types of motors and generators, No application is too large or small. Our service is particularly valuable in supporting motor or generator rebuilding and refurbishing. We can also support your concept design and prototype builds for new motor production. There is a cost savings from laser cutting to CNC punching with out incurring high tooling cost. Call us to find out more about our motor lamination capabilities.